Hello everyone. Waleska here with a flower tutorial. 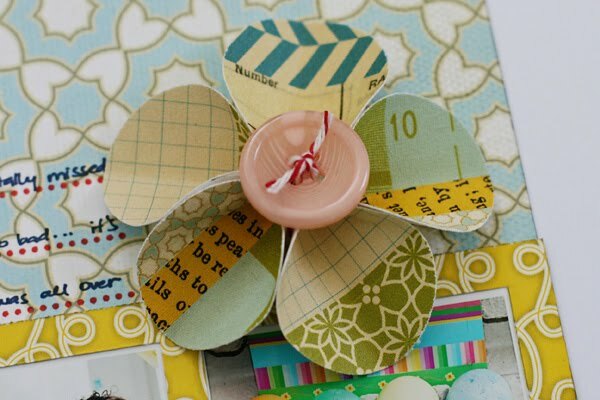 When I posted this layout to the gallery I got a lot of questions on how to make this flower so here it is (finally)! You can make these many different ways by using a variety of material (fabRips, paper, cardstock), different size punches (small, big, scallop), add a flower center or not... it's up to you. I hope you enjoyed this tutorial. Please let me know if you have any questions. cute! I am too cheap to buy flowers,,,,,lol. So I love that you made these and they match your page! LOVE IT!!! J'adore !!!! Thanks so much for this tuto! You are brilliant. I love, love, love them! Love love love these. I hope to try them! These flowers are adorable. They are so versatile too; you could use an endless variety of colors, textures, prints and centers. Thank you so much for sharing. Love these girl - thanks for the tutorial! I'm on it! Thanks Waleska! love the flower and thanks for the tutorial on it I am gonna try it. Thanks for sharing.